I didn't end up loving this salad as much as everyone else, but it was due to a serious user error--I used broccoli rabe rather than broccolini, and the bitter flavor just doesn't work well here. I'd be willing to give this another try with the correct veggie. I also think asparagus could be really nice here. I will note that the dressing turned out quite thick for me--I thinned it out with a bit of sesame oil, which was nice. I liked this salad and it's a great way to use beans and snow peas from the garden. The dressing is nice, however I do like my own tahini dressing better (adapted from The Cook's Garden book), so I will continue to make that dressing for this salad. I omitted the nigella seeds. 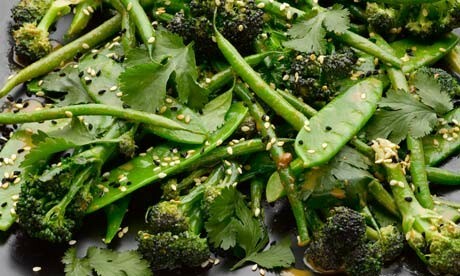 Nice way to have a lot of tasty greens with a different and very flavorful sauce/dressing. I used less honey than suggested. I loved the texture, but he dressing was just a bit sweet for my taste. This is truly spectacular. Tender crisp greens with a creamy dairy free dressing. This is definately a keeper.